Okay, maybe you won’t be on stage getting your Oscar in front of other esteemed members of the Academy, but making videos can up your social media game enough to get your brand plenty of flattering attention. 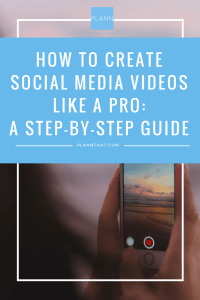 While it may be too soon to consider your acceptance speech, it won’t be long until you’re making social media videos like a pro. It’s much easier than you might think! Let’s get started. Videos are quickly becoming more and more popular on social media. From Facebook Live to Instagram videos, Facebook and Instagram Stories, YouTube and SnapChat, people are spending more time each day watching videos of varying lengths. Speaking of length, a video doesn’t need to be long to get excellent engagement from your chosen market. In fact, it doesn’t even need to last longer than fifteen seconds. Studies show this is actually the target length to capture people’s attention but not bore them in the process. Fifteen seconds. Easy. But where do you start? That’s what we’re going to help you with. Creating engaging social media videos can be a bit more challenging than writing a blog or designing a graphic image. With some planning, however, you’ll be able to create awesome and engaging videos in no time. Look at your blog posts! Your blogs are basically a well of information and resources. That blog post that your audience just loved? That’s likely a great source of content for a video. Looking at your top blogs will reveal tons of material for your social media videos. And if you don’t blog, don’t worry. Look at your most shared content. What do your followers connect with? The content that draws attention and inspires engagement is prime material for your videos. And if you don’t (yet) have a huge following that is super engaged with your social media activity? Sigh. Again, don’t worry. If all else fails, look at what the competition is doing. Look at similar brands, and see where they are having success. Take inspiration from them. ? Make a plan for your video. You’ve analyzed the data and identified the topics that hit and the ones that miss. You’ve narrowed it down to your best ideas. Now, time to figure out how to turn that into a eye-catching, engaging social media video. * Capture the attention of your targets early. Use your ninja-like skills and strike fast and hard. Videos often autoplay, so the ability to capture the attention of your audience early is key. Doing this gives you a higher chance your target will stop scrolling through their feed, back up, and view your video. * Keep it simple. Unlike most things, shorter is actually better here. So remember to ask yourself what it is you want to relate, and be sure to stick to your message. * Silence is golden! Nearly 85% of all videos are being watched in a crowded space or at work, with viewers watching on a muted device. Consider this when designing your video and use captions or text to help tell your story. Size is everything. More than half of all videos are being viewed on mobile devices. Be sure to experiment, and in time you’ll find the optimal size and orientation to make viewing your video pleasant. A square format seems to work best, and has the best results across most platforms. Grab your directors chair and your megaphone… It’s time to call ACTION! ? We’re not saying that wearing a beret makes you a better director, but can you afford to risk this? Ask no questions! Just get the beret. But happily, one thing you won’t need is an expensive studio camera. These days, any late-edition good quality smartphone will serve quite nicely. So, grab your smartphone, and let’s get rolling! Ready to capture all the action, but what else do you need to really make this video next level? * Tri-pod: Stabilizes your shoot for smooth and professional video. * Microphone: Background noise, along with poor sound quality, can quickly destroy an otherwise epic video. * Lighting: Natural light is best, of course. When unavailable, position your light source to create even light, avoiding bright spots or shadows. * Simple/appealing background: Ensure your video is free from background distractions, which may cause your audience to completely miss your message. If you can’t find a proper location, create a background using many available modular canvases, tarps, boards, etc. made specifically for this. Or DIY your own! This is when you polish your masterpiece. Now that you’ve captured all the scenes you imagined, it’s time to make the magic happen. There are several programs and apps you can use to sew together the pieces of the puzzle you’ve created, transforming your carefully planned out project into a beautifully crafted piece of social media marketing gold. 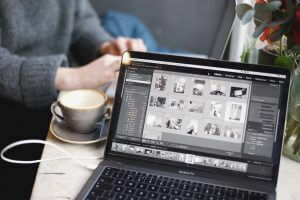 * If it’s a video slideshow you’re looking to produce, something that combines video clips, photos, and text, here are a few options: Animoto, Adobe Spark Video, Promo, and Wave are all handle this type of production well. Music can also be added to your video with a few simple clicks. * If you’re like most, editing on the go is what works best for you. Honestly who has time to sit down in front of a PC? Again, there are plenty of options: Quik by GoPro, Videoshop, and Stop Motion Studio are all available for Android or iOS. These apps are turnkey — simply pick the videos and images you want to use, and the app will find the highlights, add effects, sync transitions and put it all to music. Then you can fine tune it, and bask in the glory of being a film editor, while skipping all the boring stuff. * Want to add a little something to make it pop? Add a little sizzle? Apps like Legend or Crello can take basic text, and create impressive animations to add style and panache to your video transitions. Remember though, unless you are using 100% original material created and captured by yourself and your team, you’ll want to be cautious and aware of copyrights and royalties. This includes images, video clips, music. Always better to CYA. Time to unveil your newest masterpiece to the mass of your adoring fans. Time to climb to the rooftops, shout to the world, reveal the beauty of your creation. Hmmm, perhaps that’s a bit dramatic. Or maybe it’s spot on! YEAH! Either way, it’s time to share your creation. Include a punchy caption and share your video at a time when your audience is most active on the platform. While you’re basking in that sweet, sweet glory, remember you can schedule your video posts on Instagram (months in advance, even!) using Plann. You can plan and schedule every precious, pretty little detail of your feed, from filters to frames to color palettes. Your brand will benefit from your shiny new videos and, at the same time, your overall Insta game will be blowing up. We love our Plann community, and we love that our app can help our users to create effortlessly stylish, scroll-worthy Instagram grids. Want to find out more about Plann? Download the app for iOS and Android and start your free trial today!